Castelsardo is a picturesque historic town on the northern coast of Sardinia. The old town, fortified with a castle, is an interesting and atmospheric place to visit, and Castelsardo's position makes it a good stop on a tour between western Sardinia and the islands and resorts of the east. 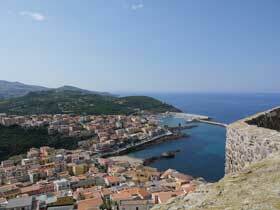 Castelsardo is an attractive place and it is geared up to welcome (and profit from) day-trippers. There are attractive restaurant tables in historic lanes, and shops selling all kinds of Sardinian handicrafts and other souvenirs. There is a tourist information office near the castle - though it was never open during my visit. Castelsardo's history is a microcosm of Sardinia's. You'll probably come across photographs of how the town used to look right into the twentieth century. On a hill on a headland stood a high wall; a citadel defended by a castle. The tight-packed town was on the headland's seaward slope. 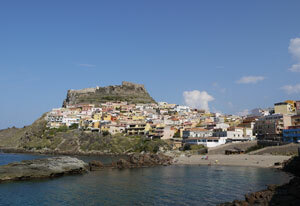 From the land side, all that could be seen of Castelsardo was the defensive wall and the castle. Then came population boom, expansion and enthusiasm for new buildings and new ways of life. Nowadays the slope in front of the citadel is covered with blocks of sunset-coloured, unattractive modern homes, a new settlement which sprawls over the saddle of land below the headland, and down to the seashore. Today the town's handful of hotels are right down by the sea, with the workaday, traffic-filled bit of town spreading up over the saddle of land below the citadel, and the bit that tourists come to see is still preserved in its old city walls on the headland. While the old town and its fortified coastal position are very appealing, the dual centres of Castelsardo - old town on the hill, new town down nearer the seashore - makes the town less user-friendly than a visitor might wish. Hotels are down by the sea, but the drab lower town is not particularly welcoming in the evening; and the restaurants of the historic upper town, those which are open in the evening, are a trek uphill. I found Castelsardo to be at its best in the daytime. A local town bus run by a company called Spina runs several times a day up to the castle, around the town and out to the nearby beach resort Lu Bagnu. This may be helpful for visitors. It is a tiring walk up to the castle, especially on a hot day; either along a zigzag road or steeply up an alley and steps. It is worth the climb, though. The picturesque old town is completely different to the modern town spread below. There are old buildings, atmospheric lanes and stairways, and enticing cafe and restaurant tables set around corners and on terraces. Castelsardo's castle, the Castello dei Doria, is the town's principal tourist sight. It houses the Museo dell'Intreccio del Mediterraneo, a museum of basket-weaving, an important local handicraft. Around the various rooms and halls of the castle are cases containing all sorts of local woven products, from fishing nets to grain storage vessels. The castle was built by the Doria family of Genoa, and for several years in the fourteenth century Castelsardo, then called Castelgenovese, was the home of a Doria bride: the Sardinian heroine Eleanora d'Arborea. 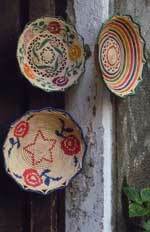 The museum is interesting, especially if you are thinking of purchasing some local woven craft products to take home. One of the best bits of the castle, though, is its terrace up among the battlements, with views over the town, along the coast, out to sea over the Gulf of Asinara and towards Corsica. The castle's opening hours vary considerably throughout the year; the lastest times can be found on the council (comune) website, listed on the right. After touring the castle, it is well worth exploring the lanes and alleys down the slopes of the medieval citadel. Restaurants and cafes have tables set up among the stairways and doorways, there are a few tourist and handicraft shops, and the citadel has a great deal of character. Traces of its grim, stone-clad, impoverished past are brightened by these modern tourist businesses. Old women sit in doorways weaving baskets, beckoning tourists over to admire their displayed goods, often very elaborate and attractive, far superior to the contents of souvenir shops (though rather tricky to pack in luggage). Below the castle, descending through the lanes to the left, alongside the town wall, are two churches which shouldn't be missed on a tour of Castelsardo. Squeezed into a courtyard right against the bare rock and defensive walls is a truly charming small church called Santa Maria delle Grazie. Look out for the arm protruding from the wall, an unusual candle-holder. The church has notable painted wood altars, and a bowed stone gallery. 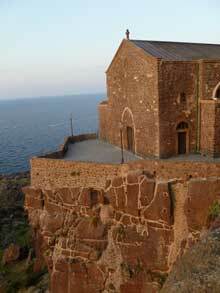 Further down the slope, perched on a terrace overlooking the sea, is Castelsardo's cathedral. The building is very impressively sited, and is particularly dramatic at sunset, when its dark stony facade takes on picturesque warm hues. The cathedral, dedicated to Sant'Antonio Abate, contains a prized fifteenth-century altarpiece by a fifteenth-century artist known only as the Maestro di Castelsardo. The crypt (unreliable opening hours) contains a museum of religious art. From the terrace by the cathedral, the visitor can admire grassy green slopes descending past a lower level of fortifications and down to the rocky seashore. Footpaths and steps have been laid out on these slopes, and although when I visited they seemed neglected, and the path network incomplete, this was still a lovely area to explore on foot, clambering down as far as the sea, with spots to sit in the sun and perhaps picnic before returning either up to the citadel or along the slopes to the modern part of town. In the lower part of town there are several souvenir shops, claiming to specialise in handicrafts - artigianato - but generally stocking a vast amount of generic tourist tat. These are worth a glance, not so much in the hope of finding a treasure, but simply to marvel at the scale of the supermarket-size souvenir emporia. In addition to out-of-town beaches - such as Lu Bagnu - accessible by car, there is also a nice small beach in Castelsardo, on the seafront road close to most of the town's hotels. It's a sandy and pleasant spot, with a small cafe-bar in the summer. One of the sights of which Castelsardo is most proud lies outside town, on the road to the east. An eroded rock outcrop draws visitors and photographers due to its remarkable resemblence to an elephant. 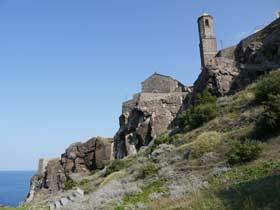 The Roccia dell'Elefante lies alongside the SS134, a short drive from Castelsardo. Two neolithic tombs are cut into the rock. In the summer months there is a once-daily direct bus service between Alghero Airport and Castelsardo, continuing to Santa Teresa Gallura, operated by Digitur. Tickets can be bought from the bus driver. A regular ARST bus service from Sassari stops at Castelsardo, with some buses continuing onwards to the holiday resort Santa Teresa Gallura. This bus runs several times a day, and takes around an hour to reach Castelsardo from Sassari. Onward buses from those two towns provide connections with other Sardinian destinations; there is also a railway station in Sassari. I visited Castelsardo as an overnight stop between Alghero and the island of La Maddalena, catching the bus from Alghero Airport, and then travelling onwards by bus via Santa Teresa Gallura to Palau, the port for La Maddalena. There are two bus stops in Castelsardo, one in the centre of the new town, by Piazza Pianedda, and one down by the beach on the seafront road. ARST bus tickets can be bought at the newsagents by the main square. 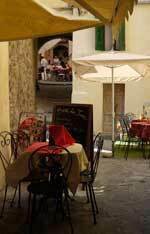 Castelsardo's handful of hotels are to be found along the seafront near the beach below town. Some more accommodation options are to be found at Lu Bagnu, a beach resort a few minutes' drive to the west of Castelsardo. I stayed at Janus Hotel, close to the beach.